Why Should I Pay that When I Can Get a Temp or Offshore VA for $5 Bucks an Hour? Ever hear a client utter these words? It’s probably the most grating sentence in our industry today. But what if you knew exactly how to respond? What if you offered your services in a way that didn’t focus whatsoever on hourly rates? Wouldn’t that be a total game changer? It’s not so annoying when you actually begin to love responding to that question (or when you no longer get it in the first place). 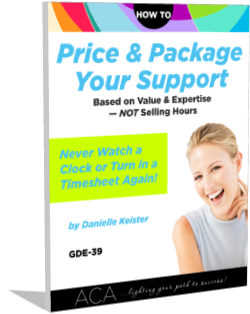 …If you find the whole topic of pricing difficult, I have the solution! And toss out those time sheets forever! …all without discounting, bargaining, or justifying your fees whatsoever! 3 Comments Posted in Administrative Consultants, Articulating Your Value, Best Biz Practices, Best Communication Policies, Billing, Earning, Financial Success, Getting Paid, Great News!, How to Say It, Knowing Your Worth, Money, Pricing, Raising Your Rates, Resources, Special Announcements, Starting Your Biz, Success and Profitability, Tooting My Own Horn, Value Is Not About Money, Working with Clients. Bookmark the permalink. I’m moving away from administrative support toward providing content but I still have some old clients… and I just wanted to say that I think what you’re doing is fabulous. Seriously, getting away from hourly pricing is a must for VAs and I hope a lot of people sign up for this. I have recommended it to a few people because I really would like to see more VAs do this and get out of the hourly “grind”. It’s definitely a passion of mine. I’m so tired of seeing colleagues struggle over this. The problem is that in providing support (not simply projects and tasks), they don’t know how to scope the work and set parameters other than selling hours. It doesn’t help when there are training organizations in our industry teaching people how to be nothing more than assistants and gophers (who only call themselves business owners) instead of administrative experts. I agree wholeheartedly but it is often a difficult concept to grasp if you are moving from an “employed” situation to a “business owner” mode. I see so many clients looking for a way to compare VAs (other than price) but because the VAs don’t offer them anything they revert back to cost. VAs need to talk “value” and talk in the clients language so that they are clear on benefits to the clients – ie. offer an experience!